Most of the time we take the running water in our homes and surroundings for granted. We are so accustomed to not having to worry about water that we can hardly imagine having to walk miles every day to access clean, safe water for drinking, cooking, washing or bathing. But an approximate 2.1 billion people around the world face this challenge every day according to a report from UNICEF and the World Health Organisation. And both the physical and time burden of water-hauling primarily falls on women and girls who make up 72% of those tasked with fetching water. 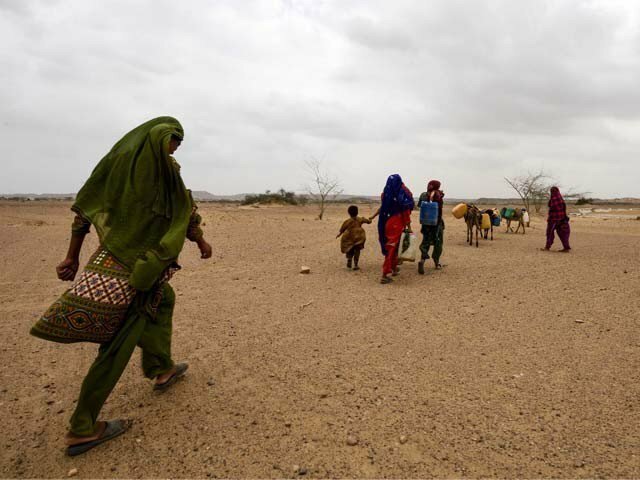 In the dry and arid land of Kohistan, a town within Thatta district in Sindh, the situation is similarly dire. Millions of people from urban and rural communities in Thatta face a severe water crisis, and some towns, including Kohistan, are impacted more than others. The continuous shortage of water has resulted in rural communities resorting to using unsafe water from wells, canals and hand pumps. Not only is this water unhygienic, women have to walk for miles searching and collecting water, carrying back heavy containers in scorching temperatures. Young girls join this effort when they are old enough, sometimes having to skip school, and both women and girls spend countless hours to access this basic life necessity. In Kohistan, the main sources of water for drinking, livestock and irrigation are springs and dug wells along with the rainwater reservoirs. Responsibility of maintaining the rainwater reservoirs usually falls on the residents, and these have remained non-functional for some time now. Recently, Coca-Cola has partnered with Indus Earth Trust (IET) for the ‘Water for Women’ project aiming to provide access to water in Kohistan through replenishment of groundwater and harvesting rainwater to the remote communities in the district. This will mainly be done by focusing on water harvesting through 28 water reservoirs and rehabilitating 10 existing dug wells along with capping and installation of hand pumps. An in-depth baseline survey was conducted in Kohistan to collect information on socio-economic characteristics, and Water Sanitation and Hygiene (WASH) status in households and schools before the project started. Through this survey, it was found that 92% of women from the surveyed households are responsible for fetching water using containers weighing 15-20 kilograms, walking 6 to 20 kilometers in temperatures ranging up to 45 degrees on their heads and shoulders. In contrast, only 8% of men collect water on their donkey carts. Along with physical problems associated with carrying heavy burdens, like strained backs, necks and shoulders, the number of hours spent by women and girls collecting water means represents lost opportunities for women who can instead use this time for other economic, educational or leisure activities. The poor water quality in Kohistan has resulted in the people of the area suffering from diarrhea, malaria, typhoid, paratyphoid, enteric fevers and hepatitis, leading to an increase in the mortality rate. Women also suffer the additional burden of tending to the sick if any of the family members fall ill due to water borne diseases. IET’s Water for Women project aims to alleviate hardship faced by these women by making clean water sources accessible to them within their area. IET, a not for profit organisation that specialises in interventions for the socio-economic uplift of marginalised communities in Sindh province, decided late last year to plan and implement a comprehensive water management project in Kohistan which will greatly increase water storage capacity during the rainy seasons, considerably lessen water losses through runoff into wide open spaces where it cannot collect, increase availability and quantity of water through rehabilitation of dug wells, greatly facilitate the drawing of water through installation of hand pumps, yielding other long-term, sustainable and life-changing benefits. When such programmes are initiated to improve access to water, it is critical to ask women about their needs and experiences. Although women and girls play key roles in obtaining and managing water globally, they are rarely offered roles in water improvement programmes or on local water committees. They need to be included as a right and as a practical matter. Numerous water projects in developing countries have failed because they did not include women. IET strongly believes in inclusion and gender equality at all levels, and all of IET’s previous and existing projects have a strong emphasis on women empowerment. IET is currently working with more than 100 women community organisations in rural areas of Sindh and Balochistan and has developed a manual of Community Management Skills Training to build the capacity of local women leaders. Keeping in line with this practice, Water for Women project will form community organisations with both women and men participating at all levels of decision-making and implementation for the project. This focus on training the community furnishes the stakeholders with knowledge, skills and capabilities to plan and manage developmental activities and to utilise the available local resources on their own. This will equip the community to take ownership, to identify problems, decide priorities and eventually adopt practices that serve community needs. Coca-Cola Pakistan has been financing and assisting in the implementation of several water conservation, availability and replenishment projects in different parts of the country in partnership with well-reputed organisations like the WWF-Pakistan, UNDP and Rotary International as the implementing agencies. The proposed Kohistan project was largely in line with both the other water projects already undertaken, and with The Coca-Cola Company’s Global Water Stewardship programme objectives. With Coca-Cola Foundation’s grant of US$180,000, the much-needed Water for Women project directly targets Sustainable Development Goal (SDG) 3 (Better health and Wellbeing) and SDG 6 (Clean water and Sanitation) and benefits about 15,000 inhabitants in 34 villages in Kohistan. In addition to projects like Water for Women, Pakistan needs broader strategies to reduce gender disparities in water access. More data needs to be collected on women’s water burden and how it affects their health, well-being, and personal development. Women need to be involved in creating and managing targeted programmes to mitigate these risks. These programmes must be evaluated to determine whether they are truly improving women’s lives. And finally, social messaging affirming the idea that water work belongs only to women must be abandoned. Former UN secretary general Ban Ki-moon has called empowerment of the world’s women “a global imperative.” To attain that goal, we must reduce the weight of water on women’s shoulders.